Mingus’ Epitaph: Jazz or Classical? Many people write epitaphs, either for themselves or in honor of the death of another person. They are usually short texts meant to be inscribed on tombstones. Rarely does someone write a jazz composition that is over 4000 measures long and takes more than two hours to perform for their epitaph. To my knowledge, Charles Mingus has been the only person to create a jazz piece of such epic proportions. Attempting to record the piece for the first time, however, was fraught with problems from the beginning. First developed in 1962, Mingus conceived this project as a “live workshop” with a big band for newly composed music. The plan was for him to write the music and record it with a live audience at The Town Hall in New York City. Thanks to United Artists Records, the deadline for the music was rescheduled five weeks earlier than originally planned. Mingus not only pushed himself to the limit, but the musicians as well, unleashing his notorious wrath upon them if he was not satisfied. As a result, the musicians were tense and fearful and the music was still being passed around during the live show. The Town Hall concert was so disastrous that Mingus never looked at the score again for the rest of his life. In 1988, almost 10 years after his death, musicologist Andrew Homzy discovered the four foot high score for Epitaph. The first full-length recording was appropriately recorded after Mingus’ death and the 31 piece orchestra was conducted by Gunther Schuller at the Lincoln Center in 1989. Finally, Mingus’ magnum opus was fully realized. The importance of this work could not be understated. As a review from the New Yorker stated, “It marks the first advance in the composition of large-scale jazz works since Duke Ellington’s 1943 Black, Brown and Beige” . Even more than 50 years after its completion, the piece still stands certainly as one of Mingus’ most difficult works. However, it is difficult to classify it as predominantly jazz or classical. Ellington’s Black, Brown and Beige as well as Gershwin’s Rhapsody in Blue are considered jazz symphonies, primarily classical compositions with jazz influences. Epitaph transcends this and becomes an integration of the jazz and classical forms rather than a work that contains influences of the other. As The Boston Phoenix appropriately states, “It’s uncategorizable. It has nothing to do anymore with ‘jazz’ or ‘classical’ music, or anything. It’s just Mingus” . 1. 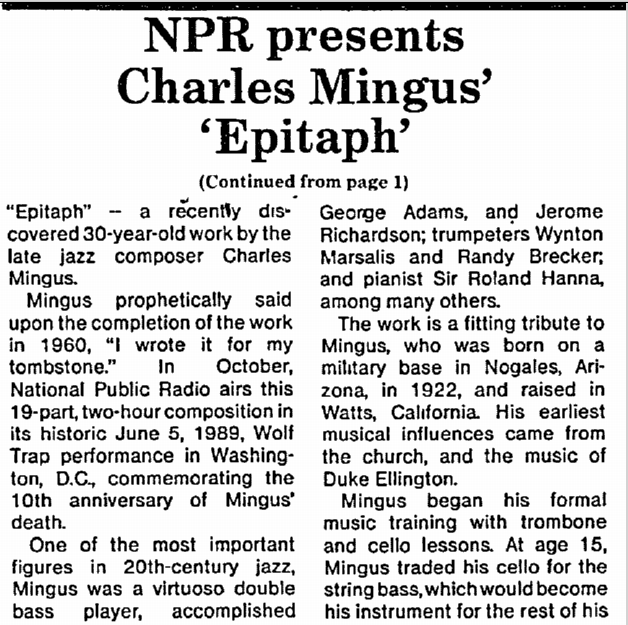 “NPR Presents Charles Mingus’ ‘Epitaph. '” Chicago Metro News, Sept. 30, 1989. http://www.infoweb.newsbank.com (Accessed April 6). 2. Balliett, Whitney. “Jazz: Mingus Regained.” The New Yorker, August 21, 1989. http://mingusmingusmingus.com/mingus-bands/epitaph (Accessed April 6). This entry was posted in Donny Sison and tagged Charles Mingus, classical, Duke Ellington, George Gershwin, Gunther Schuller, jazz, NPR, Rhapsody in Blue, United Artist Records by sison. Bookmark the permalink.